Years ago I took a personality test called Myers-Briggs which confirmed that I am a highly intuitive person. These days as I refine a process that I have for creating art quilts, I fully appreciate and trust the value of this intuition. In the process that I am refining, construction begins with a blank piece of muslin tacked up on my design wall. Maggie McNabb writes in her book, Design by Nature: Using Universal Forms and Principles in Design (Voices That Matter) , that emptiness gives you a point from which to start from. 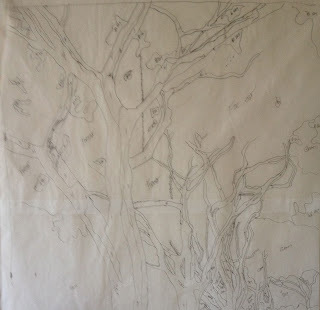 As I begin to fill in my muslin, I use a 'map' that I create by abstracting from a photo that I have been attracted to. 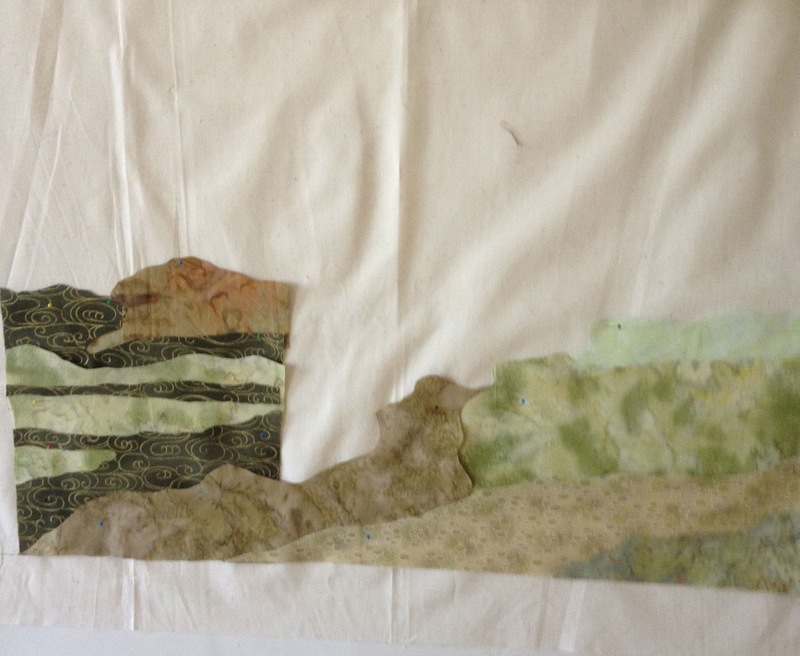 I begin to fill in parts of the muslin with fabric, following the rough guidelines of my maps. While intuitive play is somewhat constrained at this point by my map, I always grant myself the option to not follow my map. Contrary to some other approaches that use a guide from a photograph as a strict diagram for their art quilt, my map marks a general direction to my goal. Once the muslin is filled with fabric, the stitching part of my process begins. This is where intuition plays a major role. It is in the thread painting and quilting that my art work really comes to life. 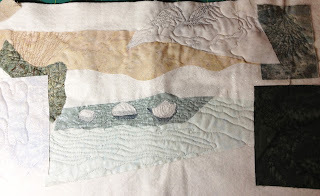 As I quilt each portion of a project, I allow my intuition to guide me. I actually create a 'sample sandwich' with pieces of fabric from the art work that I test various quilting ideas upon. This give me a general idea of how the quilting of a particular area like the mountains or a tree might look. As I actually quilt my piece though, I really allow the fabric to 'speak' and guide me. This is often the most exciting part of my process. In Winter Morn, for example, I had a general idea of how to approach quilting the river. I started according to plan but soon was listening to the fabric and trusting my intuition. Quite honestly, when I completed the section, I wasn't 100% certain of what I had done. 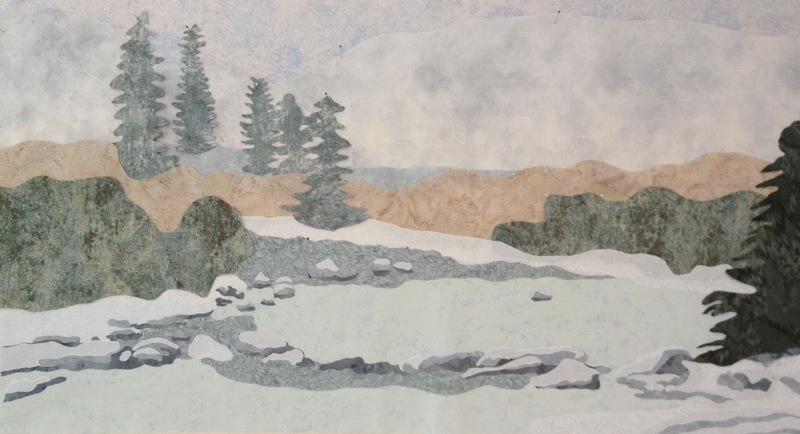 It wasn't until I viewed my piece from a distance that I realized my intuition had transformed the river from a quiet stream into a more interesting element - a dynamic flow rounding a bend. I have taken a number of design classes with Dena Crain. An observation that shows up repeatedly in classes is the recognition that there is a point where you, the artist, surrender to the piece you are creating. If you allow that to happen, the piece will show you what needs to happen next. This is where intuition rules the day. When this occurs in the creative process, it reminds me of those perfect moments on the mat in my art of aikido where you totally blend with your partner and joy results. To be one with the universe. Thanks for sharing your process, Judy! It is interesting to me to see how creative work is approached by others. Love your "Winters Morn"!